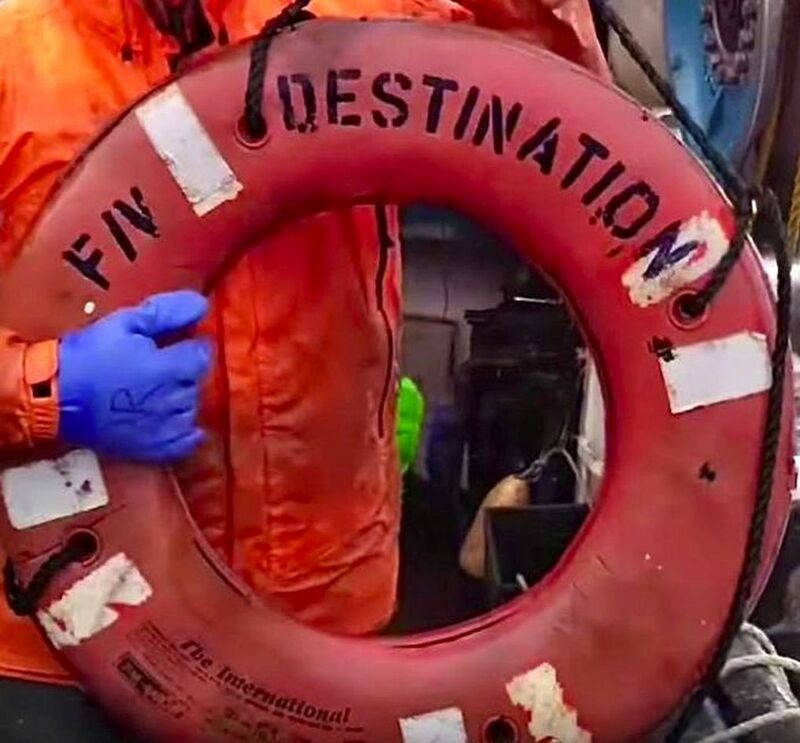 The Seattle-based Destination went down without a mayday call two years ago this week, stunning a Bering Sea crabbing industry that appeared to have left its deadly legacy behind. A former crewman is haunted by what may have gone wrong in the sinking that killed his brother and five others. Dylan Hatfield was back in the wheelhouse of the Destination. 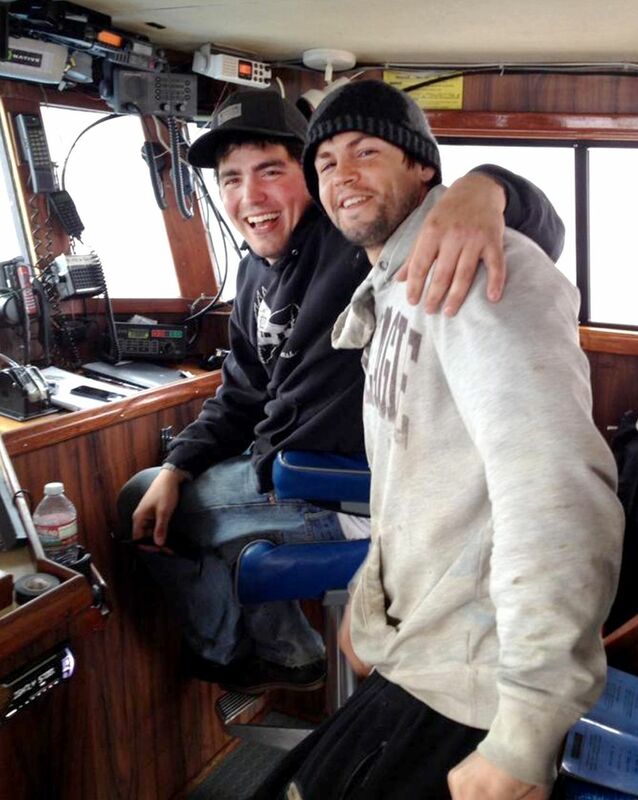 He held his older brother’s hand as the 98-foot crab boat bucked through the Bering Sea. His brother, Darrik, offered only a smirk, then the boat rolled on its side. This was the first of Dylan’s many dreams about the sinking of the Destination, the Seattle-based crab boat that went down early Saturday morning, Feb. 11, 2017, taking the lives of all six of the crew. Dylan had worked on the Destination for a half-dozen seasons, leaving in 2014. 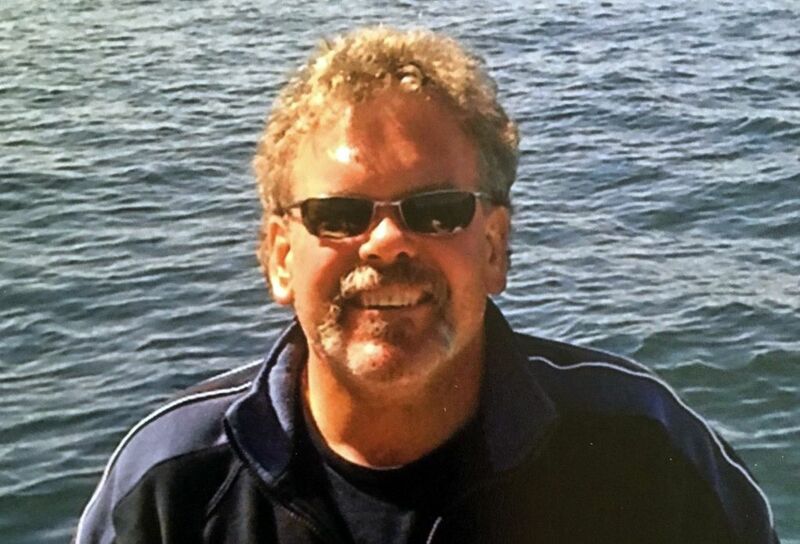 The captain, Jeff Hathaway, was his mentor, a seasoned skipper who taught him crab fishing. Others lost included his brother, Darrik Seibold, and close friend Kai Hamik. Dylan helped both get jobs on the boat. After the sinking, sometimes deep into the night Dylan woke up terrified, hearing the screams of the crew in what seemed an awful peek into those final moments. 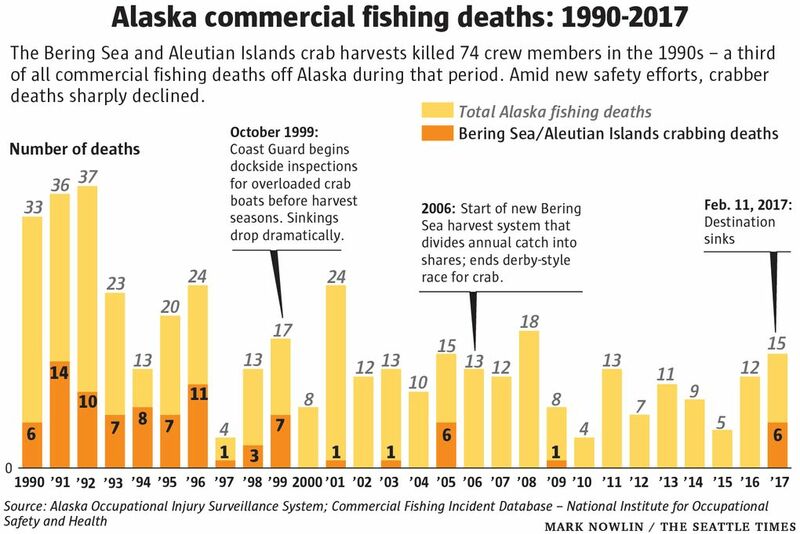 The Destination sank after more than a decade of relative safety in a Bering Sea crab fleet that appeared to have left behind the deadly legacy of the late 20th century, when dozens upon dozens died as their boats went down. For industry veterans, the loss of the Destination was a gut-check that spurred reflection: Are we as safe as we think? Hathaway, 60, was one of the most savvy, experienced skippers of his generation. 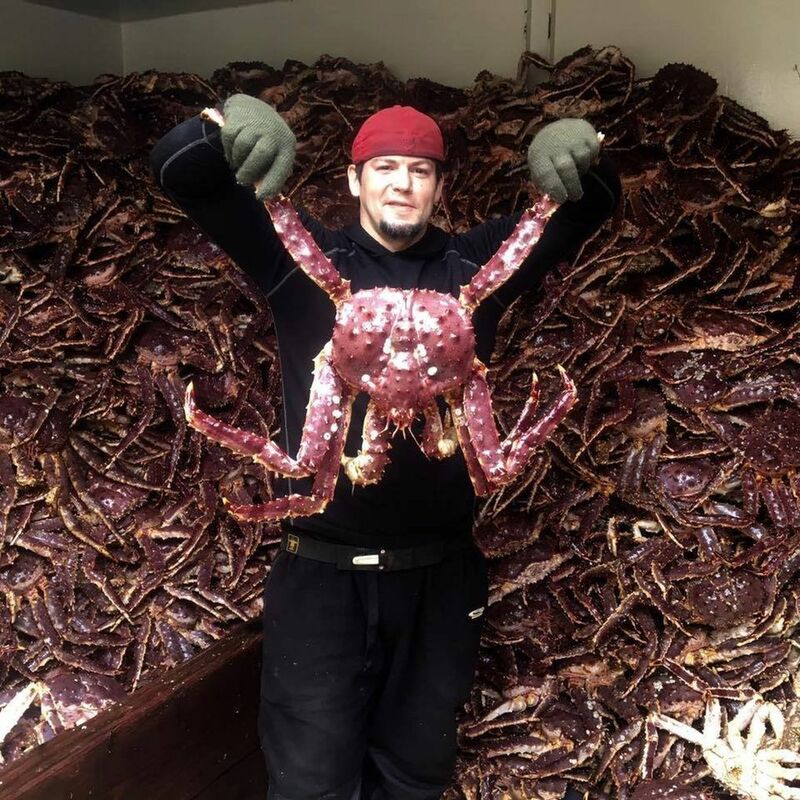 He nimbly made the transition from a fiercely competitive race for the crab to a new era that began in 2005, when each boat was assigned a share of the total Alaska harvest. No mayday call was picked up after the Destination left the lee of St. George Island and entered turbulent seas. A ghostly tracking image from the boat’s transponder captured the last minutes. The boat slowly turned in an almost complete circle, a death spiral before sinking. 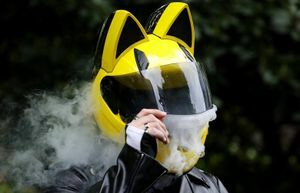 The National Transportation Safety Board concluded that freezing spray coated the Destination, making it disastrously top-heavy. The agency blamed Hathaway for venturing out in hazardous conditions without taking proper precautions, and then — once at sea — failing to have the crew combat the ice build-up. Yet a Coast Guard analysis — using computer modeling — shows that long before the winter storm, the Destination’s margin of safety had been eroded by changes to the vessel and gear. By the time the crew set out on its final voyage, according to the analysis, the heavily loaded boat failed to meet minimum stability standards called for by a 1988 act of Congress. This assessment is part of a broader Coast Guard report expected to be made public this year — a document eagerly awaited by families struggling to understand what could have gone wrong for such an experienced crew. 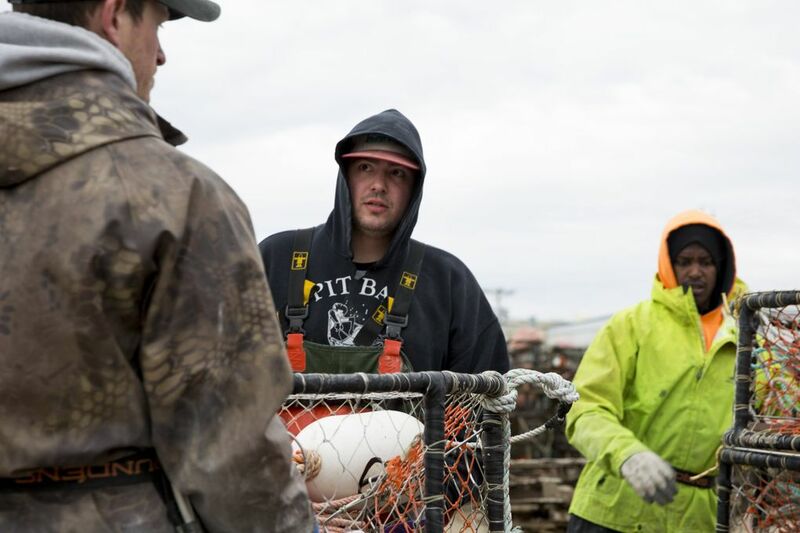 For Dylan, 30, Bering Sea crabbing once seemed like the ultimate rung in a commercial fishing career. He was proud to be part of the elite crews whose immense physical stamina could earn big paydays. In the first year after the Destination went down, Dylan was unsure whether he could return to Alaska’s king and snow-crab harvests. Sue Hathaway, the widow of the Destination’s captain, came close to death herself more than 35 years ago when a boat she was on capsized in the Bering Sea. 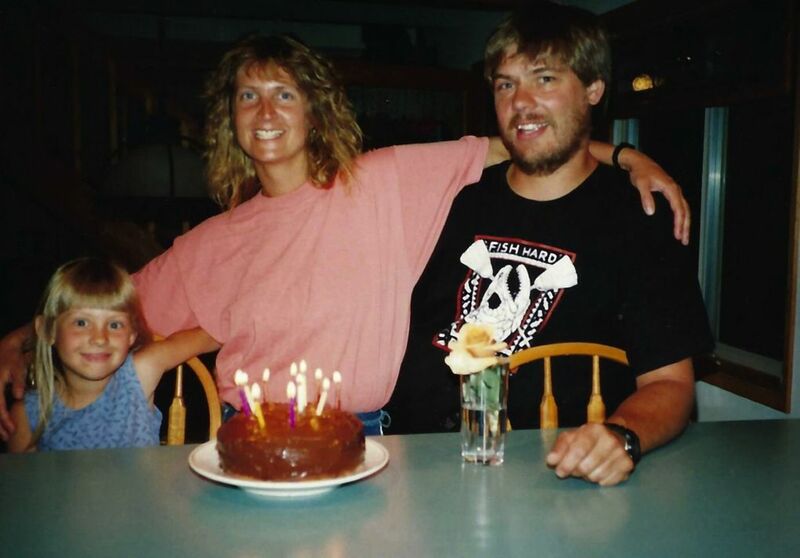 Jeff and Sue met in 1979 aboard the crabber Karin Lynn. She, the cook demanding respect in the galley, clashed with the shaggy-haired crewman who left tools on the table where meals would be prepared. One day she threw them all on his bunk and gave him a scolding. She didn’t put her pots and pans in the engine room, and he ought to keep his stuff out of her workplace. It was the start of a shipboard romance between two Seattleites who grew up in a city yet to be transformed by the dot-com boom and Amazon. Back then, the seafood industry held a much higher profile, drawing fresh recruits from the city’s youth. Susan Pierce Hathaway is the daughter of jazz musician Ronnie Pierce, a skilled master of reed instruments who played for decades around Seattle until his death in October at age 90. Sue graduated from Shorecrest High School, and by the time she was 19 had found a spot on the Karin Lynn. She made no bones about why she was there — to pull down a wage. Jeff’s father was part-owner of a women’s clothing manufacturer and his mother was a teacher originally from Idaho, where the family vacationed and Jeff went trout fishing. 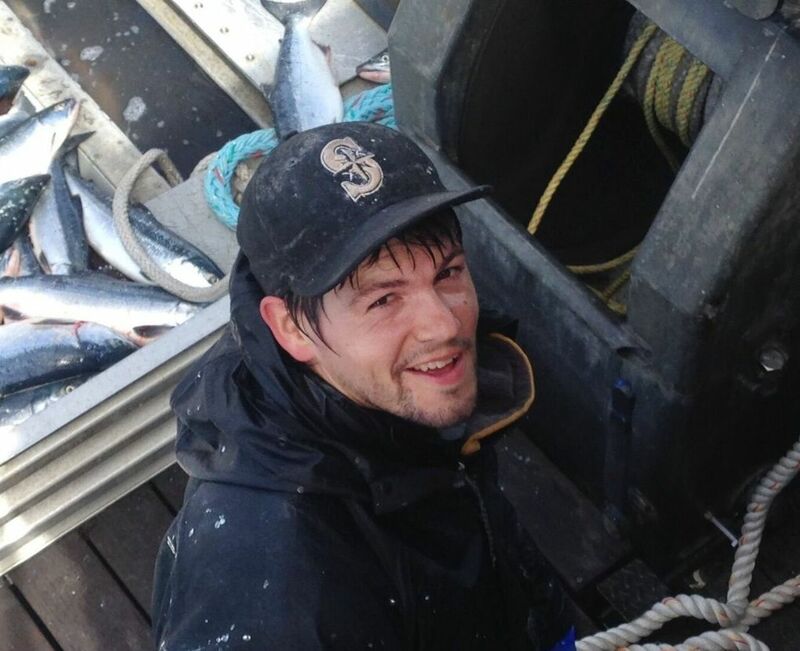 He dropped out of Queen Anne High School to crew on salmon boats, then landed a job as a Bering Sea crabber. The couple worked off Alaska during an exciting time in North Pacific fishing. The U.S. fleet was just starting to flex its muscle under a 1976 law that gave American boats first claim to all seafood caught within a 200-mile coastal zone long dominated by foreign vessels. In Ballard, that set shipbuilders, fishermen and processors to dream of a big fleet expansion to take pollock, cod and other fish along with the high-dollar hauls of king and snow crab. This was also a perilous time. The Bering Sea was a killing zone for American fishermen, with crabbing the deadliest harvest. Some captains overloaded their boats with pots, and crews worked through the storms to claim the biggest catch possible. Crewmen were crushed by pots, swept overboard by waves, dragged off their boats after becoming entangled in gear. The biggest number died when their boats sank. Those killed in the quest for crab included some of the young couple’s friends. In 1983 — when four crab boats went down in a month — Sue helped get two Anacortes-based boats, the Altair and Americus, ready for sea. She almost signed up as a cook on the Americus. Then, on Feb. 14 of that year, in what remains the worst day in the history of Alaska crabbing, both boats sank in the Bering Sea. All 14 crew died. Sue, then 24, had opted to spend another year — her fifth — aboard the Karin Lynn. When the vessel stopped for repairs at Akutan in the Aleutian Islands, Sue was ready for a break. She needed a way back to the port of Dutch Harbor, where she could take a flight home to Seattle. So, she hitched a ride on another crabber, the Arctic Dreamer. On March 11, 1983, en route to Dutch Harbor, that boat went over. She pulled on an insulated survival suit before getting dumped into the ocean. She later told The Seattle Times she went under three times, and bobbed in the frigid water for three hours. After she and the five crew made it into a life raft, death continued to seem like a possibility. Sue wondered who would care for her dog and horse. She and the others prayed and yelled for help as big swells tossed them about. Another fishing boat came to the rescue. Hours later, in a Dutch Harbor bar, Sue wasn’t sure whether she was jinxed, or lucky. Would she ever go crabbing again? “I have a fishing pole. I’ll stick to trout,” she declared. Still, the next year, Sue headed to Alaska for a final work season, this time on a fish-processing vessel. She and Jeff got married, and would settle down back in Washington on acreage near Port Orchard, where they built a corral and horse stables. They raised ostriches, and farmed oysters with a crew member from the early years. But Alaska crab remained key to the family’s prosperity. Jeff worked his way up to skipper of the Karin Lynn. In 1994, he took command of the Destination. Each fall and winter, he headed north. Dylan Hatfield grew up in Petersburg, a Southeast Alaska community defined by its fishing fleets. As a boy, he and his friends walked the harbor, pointing out the boats they hoped to work on. By the time Dylan was 12, he was packing Dungeness crab. In his teens, he spent summers fishing for salmon. At 18, Dylan gained a Bering Sea crew slot aboard the Seattle-based Destination. The work was cold and exhausting: trapping cod, king and snow crab with heavy, steel-framed pots that had to be baited, dropped overboard and retrieved in a cycle repeated week after week. The captain, Jeff Hathaway, could be intimidating. A line carved into the galley table marked his exclusive spot. He was known to wave a fork at those who dared crowd his domain. In his first few weeks on board, Dylan kept quiet at meal time. Hathaway also could be a volatile taskmaster, and over time the young crewman learned to stand his ground. Once, Dylan, while operating the ship’s hydraulics, overloaded a generator, causing it to break down. For more than an hour, all work stopped as Hathaway, in pajama bottoms and flip-flops, and Dylan — standing 6-foot-4 and weighing 220 pounds — hurled insults and profanities at each other. They later would declare a truce, and Dylan says his bond with Hathaway grew stronger, bolstered by the many months of sea duty and adventures that could be found in the most unlikely of places. During a memorable stay in Dutch Harbor, Hathaway walked onto a snowy hotel porch to feed a french fry to a bald eagle while Dylan shot video of the spectacle. Hathaway would have to expose his finger to a sharp beak. He did not back down. “Hey, buddy,” he called to the giant bird, and the eagle grabbed the fry. Hathaway’s bravado was mixed with pain. At sea, the captain played a video full of scenes of his earlier crabbing years, pointing out the friends who were now dead. On shore, the tales of that bygone era continued as Hathaway treated his crew to lavish meals. Hathaway’s awareness of his own mortality was on display during man-overboard and abandon-ship drills. He used these exercises to draw out the crew to talk about what could go wrong, and how to avoid bad outcomes. Dylan learned early what could happen. On his first day in 2008, a pot smashed into a crewman. Rather than quit for the day, he walked off his injury and within a half-hour — still in pain — was back at work. Still, Dylan came of age in a much safer time in Alaska’s crab industry than those who labored in the 1990s, when the deaths of more than 70 crew members gave momentum to reforms. Beginning in the fall of 1999, the Coast Guard, a front-line regulator of the fleet, launched dockside spot checks before the harvest. Vessels overloaded with pots, or lacking safety gear, would need to make changes before heading out. In 2005, a bigger — and far more controversial — change ended the race for crab. Under the new system, boat owners were vested with lucrative harvest shares based on their catch history. Crews no longer had to compete with each other through the worst of weather in a mad-dash derby. These harvest shares could be sold. Or they could be leased, so the crabbers, as they retired, could continue to reap profits without owning a boat and hiring crews to put down pots on the ocean bottom. 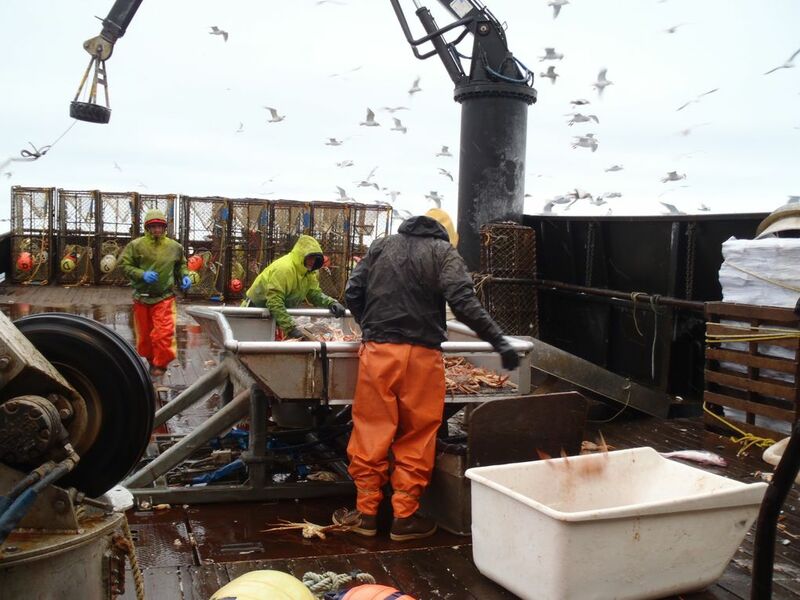 This fundamental shift offered new control of the public resource to more than 450 operators — dominated by an aging generation of crabbers — with harvest shares that now have a collective market value of more than $900 million, according to Dock Street Brokers. The younger generation, such as Dylan, could earn more than $100,000 a year. But some crew take a significant financial hit to cover the cost of leasing harvest shares. And, no matter how long they work on a boat, their time at sea does not entitle them to claim any harvest shares. If they want them, they must buy them from others, such as David Wilson, an owner of the Destination who managed the boat from his home north of Seattle. 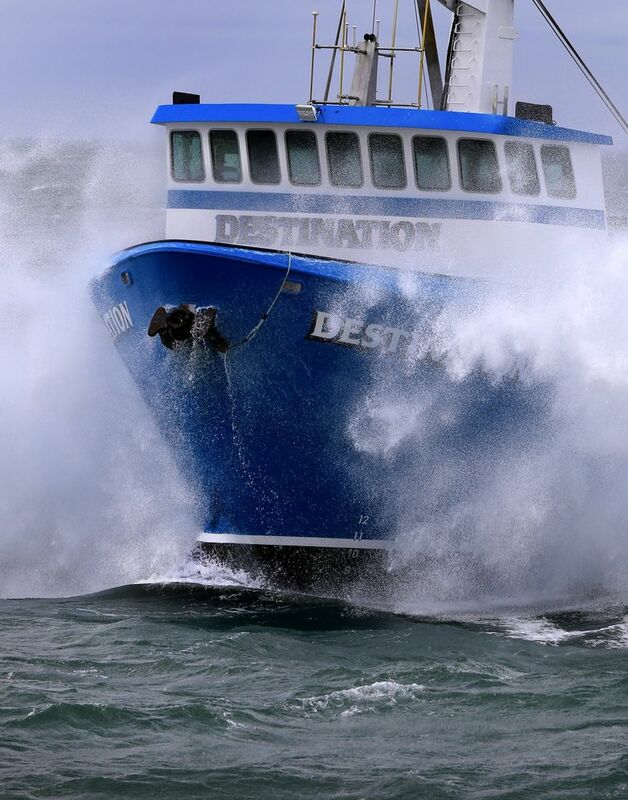 Destination Inc., the enterprise that Wilson has a stake in, holds crab shares worth more than $5 million, according to a Seattle Times review of federal records. In the decade after the share system took hold, the Bering Sea crab fleet shrank from more than 250 boats to fewer than 70 boats. The winners and losers in this restructuring were the topic of many a shipboard conversation among Hathaway and the Destination crew. Hathaway bought some of the crab shares but chafed at what he saw as unfair changes to the harvest. Dylan shared his frustrations, feeling he was born too late to stake a claim. In 2011, the Destination crew had a new member — Dylan’s older brother, Darrik Seibold. The two spent part of their boyhood together with their mother in Petersburg. Dylan recalls his older brother as an artist and inventor who filled the family basement with mechanical body parts as he attempted to build an exoskeleton. Darrik left in his teenage years to live with his father in Washington state. Aboard the Destination, the brothers were an awkward pairing. And Darrik didn’t like taking orders from his kid brother. After a year, Darrik left the boat. In 2014, Dylan also left. A crewman’s career can be short. The life is grueling. Many quit as their bodies wear down. Dylan wanted to make more money and looked for more lucrative pay on another boat. He could tell the Destination’s captain, Hathaway, was hurt by the decision. He proposed that Darrik return and take his slot. By then, the brothers, during a summer of commercial salmon fishing, had made their peace. Darrik appeared to be letting his guard down and reaching out more to the family as he embraced fatherhood. His son, Eli, was born in February 2014. “It seemed for the first time in my life, I was really getting to know who my brother was,” Dylan said. On Feb. 8, 2017, the Destination had yet to begin the winter snow-crab harvest, but Kai Hamik already was worn down from nearly a month at sea using baited steel pots to trap cod. Kai’s back was ailing, and when he woke up, he couldn’t feel his hands. During one exhausting 40-hour stretch, Kai texted his parents that he’d slept only six hours. Once, he was so tired, he keeled over in the galley, lacking the energy to climb into his bunk. They had spent nearly three times longer fishing for cod than the year before. And the money wasn’t nearly as good as for crab. In a call during a port stop in Sand Point, Alaska, he told his mother fatigue had dragged down crew morale. Judy Hamik was surprised by her son’s dour mood. Born in Alaska, Kai had spent his early years in Sand Point, a treeless island fishing port at the eastern entry to the Bering Sea, where his father had worked as a commercial fisherman. 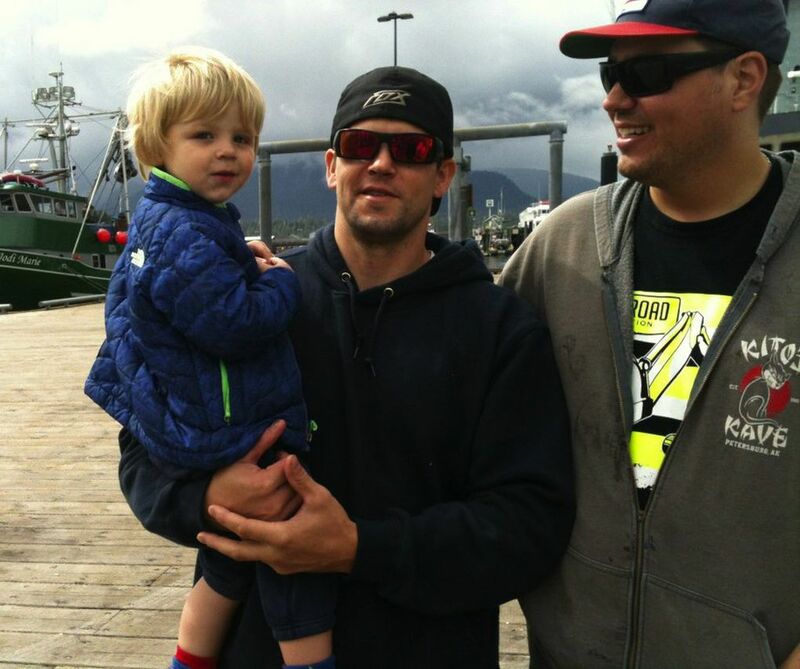 The family moved to Arizona, but Kai returned to Alaska to catch salmon and later, in 2011, to work on the Destination. He seemed to have boundless enthusiasm for the job, enduring long stretches at sea with grace and humor. Through his years on the boat, videos Kai made — often set to rock and rap — chronicled the crew’s lives, from harrowing scenes of sending pots overboard in high seas, to silly dance moves performed on pitching decks. He was loyal, once rejecting an opportunity to go to work on another crabber where he likely could have made more money. But Kai, at the age of 29, was tiring of life aboard the Destination. Before the start of the 2017 season, he told his mother it might be his last year. Kai and his girlfriend wanted to move into a house in Western Washington, and he would trim back his time in Alaska to summer salmon fishing. For now, though, there was more crab to catch. 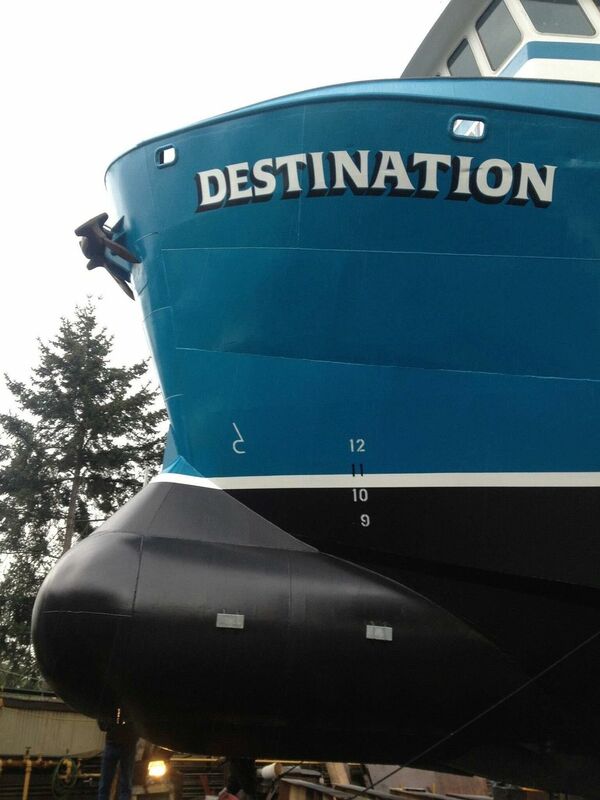 On Feb. 8 at 10 a.m., the Destination pulled out of Sand Point. Judy Hamik urged Kai to get some sleep. “I love you,” he replied. The cellphone call dropped, but he was able to text an emoji of a face blowing a kiss. The next day, the Destination arrived at Dutch Harbor in the Aleutian Islands to take on squid bait and fuel. There, the boat hosted a visitor, Dylan Hatfield, a former crewman who’d spent six years aboard the Destination and was giddy with anticipation about this reunion. 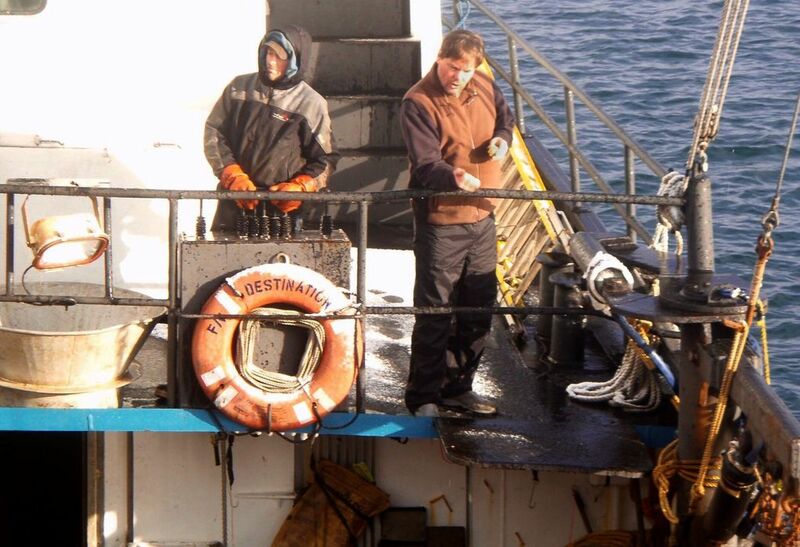 The captain, Jeff Hathaway, had given Dylan his first big break on a Bering Sea crabber. 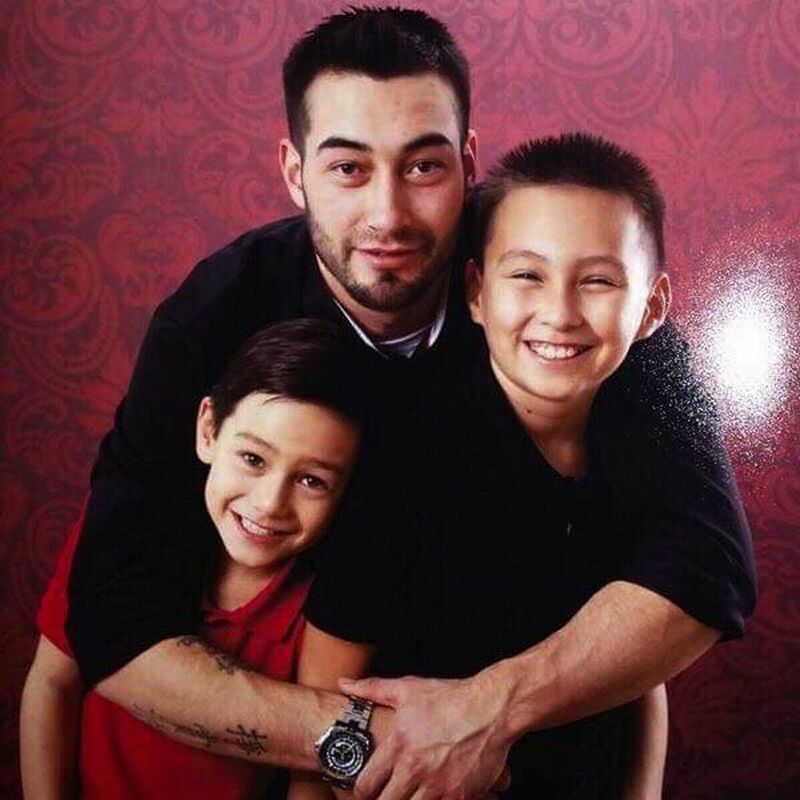 The crew included his brother, Darrik Seibold, and Kai, one of his best friends. There were hugs and stories of crab seasons past as the men broke open an 18-pack of Rainier beer. Dylan had been on a crab boat that already had caught its share for the season. He wanted more work, and asked if Hathaway knew of any openings. The captain gestured toward Darrik: Dylan could replace his brother. Dylan thought the captain was making a bad joke. He brushed off the offer. Dylan would later learn his brother had reason to get off the boat. Darrik had hurt his hip during the recent cod harvest, according to texts that Kai had sent back home. Still, Darrik was not going to give up his place on the Destination. He stayed silent about his injury. In the evening, Dylan joined the crew for pizza at the Norwegian Rat Saloon. Dylan wanted to party, down a few shots. His friends looked haggard, still beat down from the cod season. “It was a table full of long faces,” Dylan recalls. 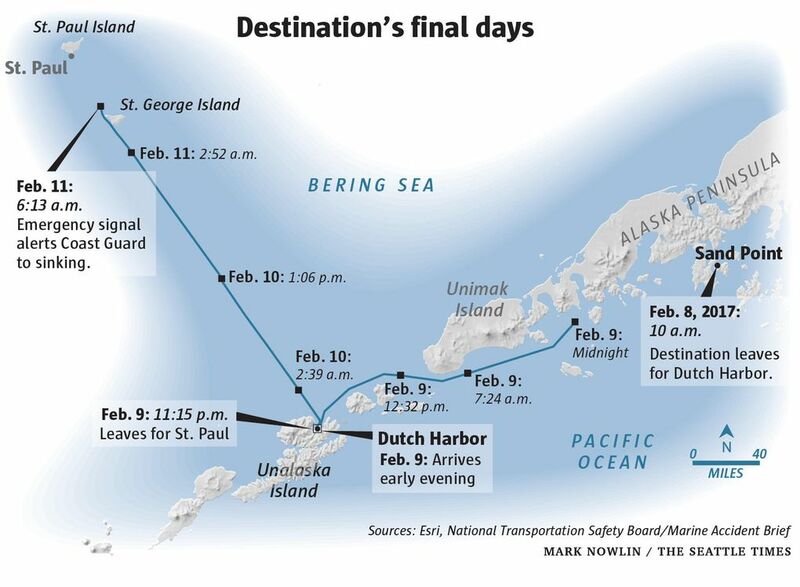 The Destination faced a dicey weather forecast as the boat left Dutch Harbor at 11:15 p.m. on Thursday, Feb. 9. The National Weather Service called for nearly 40 mph wind gusts over the next two days, up to 13-foot seas and temperatures down to 18 degrees. At that temperature, ocean spray would coat the vessel and gear in ice. The added weight, if not removed, would increase the risk of capsizing. Hathaway had encountered plenty of icing in his 23 years as captain of the Destination. He understood the hazards. He had lost friends to boats that went down. But the captain was under pressure to leave Dutch Harbor because the boat — after the long cod season — was getting a late start on snow crab, which would be caught off the Pribilof Islands some 250 miles to the north. The Destination had to deliver its catch to Trident Seafoods on the island of St. Paul; the plant planned to shut down crab processing by Feb. 25. On the radio with another skipper, Hathaway fretted it would be hard to catch the boat’s quota by then. Hathaway is assumed to have filled the deck with some 200 pots, stacked five high. This was more pots than some other skippers say they would carry — especially with freezing spray predicted. But it was typical for Hathaway for the start of the season. He wanted plenty of pots to catch crab, and any elevated risk would not last long. In a few days, he expected to lighten the load by dropping the baited pots overboard at the harvest grounds. Hathaway might have taken assurance from the boat’s onboard loading guide. The stability booklet was developed in 1993 by naval architects hired by Destination owner David Wilson to scrutinize the vessel and develop safe operating procedures. The booklet indicated the stack was under the Destination’s 224-pot limit for winter. The boat was supposed to be safe to take to sea. A Coast Guard Marine Safety Center study would later come to a strikingly different conclusion. The Destination had significant stability problems before it left Dutch Harbor, according to the 18-page report, based on computer modeling. Investigators questioned basic assumptions made in the stability booklet, which put each crab pot’s weight at 700 pounds. That might have been true once. But not by the time the boat departed from Dutch Harbor almost a quarter-century later. A Destination pot — the only one retrieved from the sea floor the summer after the boat sank — weighed 840 pounds. The Coast Guard analysis assigned that weight to each pot on deck for the boat’s last voyage. The report concluded the Destination had too big a load to meet federal stability regulations developed for a landmark 1988 commercial fishing safety law. Any ice — or water washing onto the deck — would only add to the potential danger. Another safety risk resulted from the Destination’s design. Nine ports in the boat’s side allowed water to seep overboard. But the holes were too small, less than half the size required, according to the Coast Guard report. This meant water would drain from the deck more slowly, and the port openings — in cold weather — would become more vulnerable to freezing over. Structural changes to the boat also may have contributed to stability problems. In 2012, Wilson paid a shipyard to install a snout-shaped bulbous bow. Grafted onto a boat, this can help a vessel move through the water with less drag, improving fuel efficiency. 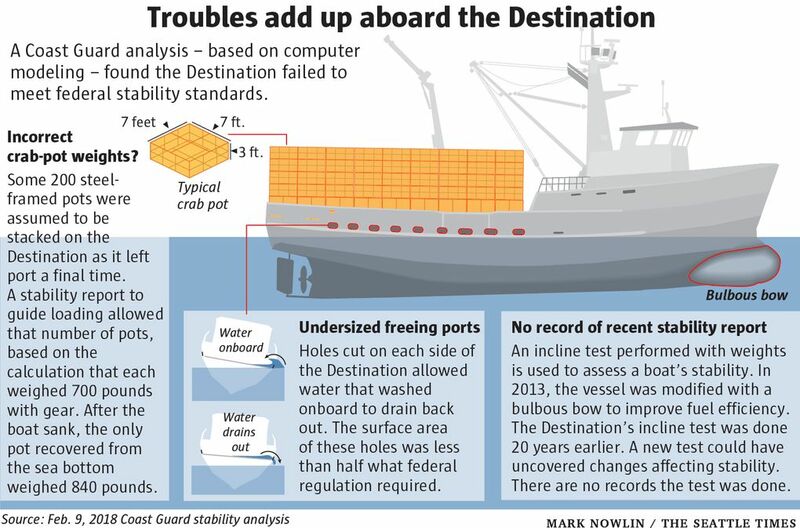 Some crabbers have been leery about adding a bulbous bow, concerned the change might reduce the number of pots that naval architects would allow to be stacked on deck. “That’s what came back to us,” said Gordon Kristjanson, the retired captain of the Aleutian Mariner, who considered, but decided not to go ahead with the modification. Gisli Olafsson, a Seattle-based naval architect hired by Wilson to design the Destination’s bulbous bow, did not call for any reductions in the pot limit. In a Jan. 28, 2013, letter to Wilson, Olafsson wrote that the captain should be “totally safe” to continue operating under the loading instructions in the stability booklet. 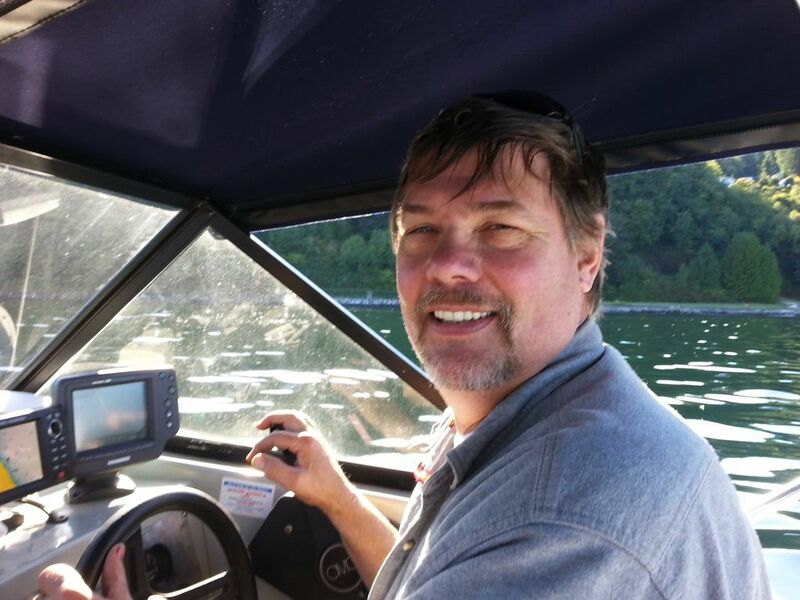 He told The Seattle Times his calculations showed the boat met federal safety standards but said the letter was only valid for a year — and that he did not know how the conditions of the boat might have changed by 2017. The Coast Guard found the bulbous bow had reduced the Destination stability. Investigators wrote that the righting arm — the angle at which the boat would roll over — was decreased, and fell further below the standards required by federal regulations. Hathaway told family and friends he was pleased with the performance of the bulbous bow. Dylan remembers a rocky first ride north after the installation. He said the boat had a different feel — a hesitation before finishing each roll. Captain Bill Prout savored a cup of coffee in the wheelhouse of the Silver Spray at the tail end of his winter season catching snow crab off Alaska. At 6:15 a.m. on Saturday, Feb. 11, 2017, the Bering Sea sunrise was still more than two hours away. Over the marine radio came a Coast Guard call-out: A distress signal had just been picked up from the Destination. The temperature hovered around 12 degrees, which meant sea spray could freeze on boats and add potentially dangerous weight. Still, Prout didn’t think much of this radio report. He knew the Seattle-based Destination as a good boat with experienced crew. And, the captain, Jeff Hathaway, did things right. Maybe, in trying to shed ice, they had inadvertently knocked into the emergency locator beacon, setting off a false signal. Shortly after 6:30 a.m., Prout got a call from the Coast Guard. Could he try to hail the Destination on his radio? Prout remained unconvinced that something was wrong. Maybe the Destination crew — for some reason — had turned off the radio. How could he be sure? Prout and crew changed course to go the 20 miles that separated their boat from the coordinates indicated by the distress signal. Some 31 hours earlier, the Destination had left the Aleutian Island port of Dutch Harbor. The goal was to reach the Pribilof Island of St. Paul, drop off a load of bait, then begin the snow-crab harvest. If the six crew members followed their normal routines, they would catch some sleep between shifts of watch duty, which typically lasted up to two hours. On this northbound journey, the Destination would have ridden in the trough of the waves, exposing the boat — and its load of crab pots stacked five high — to the freezing spray. The National Weather Service was forecasting light, then moderate and finally heavy spray for the last 14 hours of the boat’s trip to St. Paul. The forecast appeared to be on target, as some other captains encountered difficult conditions. On Friday, Feb. 10, ice up to 6 inches thick accumulated on the crabber Polar Sea as that boat traveled to St. Paul. The captain would later report that he stopped the boat four times — and each time, it took hours to break off the ice. A transponder tracked the Destination’s course and speed, generating data later obtained by Coast Guard and National Transportation Safety Board investigators. Shortly before 10 p.m. on Friday, the Destination changed direction and slowed for about an hour. Perhaps to allow the crew to tighten the chains that secured the load of pots. Perhaps to allow the crew to attack the ice with mallets or 6-foot steel pry bars. Even then, it can be hard to knock ice off big loads of pots. So, in extreme weather, a skipper may drop some pots overboard. Mostly, the boat traveled at speeds that would have made it hard for the crew to get out on deck and remove the considerable ice that — by the morning of Saturday, Feb. 11 — likely would have accumulated. 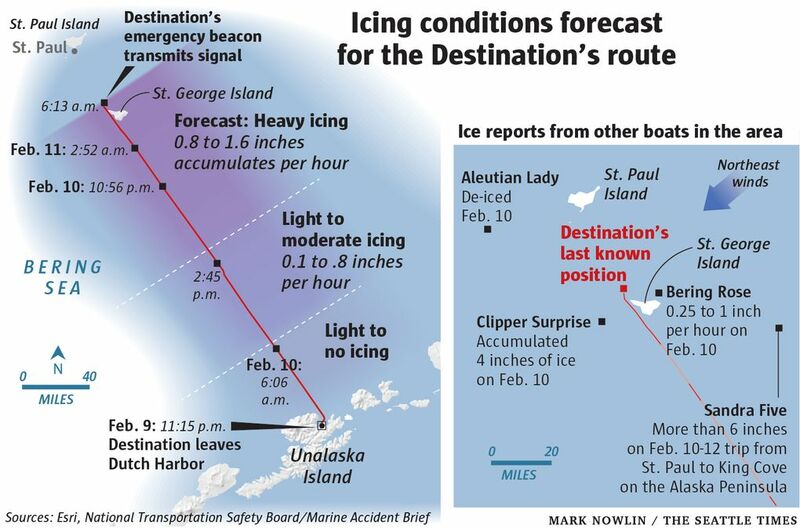 The best — and final — opportunity to clear some of the ice would have come shortly after 5 a.m. as the boat began passing through the sheltered waters in the lee of St. George, an island south of St. Paul. The captain, Hathaway, at this early hour, could have been resting in his bunk, with a crewman on watch. He also might have been up — concerned about freezing spray and surveying the situation from the wheelhouse. “He has done that many times, and I’d done it with him,” said Dan Jansen, another Bering Sea captain and one of Hathaway’s close friends. Whoever was at the helm chose to forge on. As the Destination motored past St. George, the boat increased its speed to about 10 miles an hour. There was no pause to break ice. Why, will never be known. “That is the question that has haunted me,” said Michael Barcott, an attorney representing the boat’s owner, David Wilson. At 5:55 a.m., the Destination cleared Dalnoi Point on the edge of St. George Island. The wind was blowing from the northeast as the boat entered a notorious stretch of water roiled not only by the wind but by strong currents intensified by the island land mass. The transponder track shows the Destination slowed down. The boat jogged to the east. It made a sharp turn and began a final, slow pirouette at 6:12 a.m., turning almost completely around. This video, generated by the Destination’s transponder, shows the boat turning in a nearly complete circle in its final minutes. The red dot marks where the transponder stopped working. Investigators considered that the boat may have had a steering problem, as it sometimes had in the past before a major repair. But they largely discounted that scenario, in part, because the boat’s demise coincided with leaving the protection of the island’s lee, according to a National Transportation Safety Board (NTSB) report released last July. That report also did not cite evidence of a disastrous leak. Instead, investigators presume that rough seas pushed the ice-laden boat on its side, perhaps turning it over altogether. From 92 to 154 tons of ice may have frozen onto the vessel, creating a “high probability of capsizing,” according to a university study that used wave impact, weather and other information provided by the NTSB. Most of the crew — Hathaway, Kai Hamik, Charles Glen Jones, Larry O’Grady, Darrik Seibold and Raymond Vincler — likely would have been trapped in their bunks. No time for a mayday call. Even the man on watch could have been down below for an engine-room check typically scheduled around that time. The rudder likely would have stopped functioning, the boat then pushed about by the currents. At 6:13 a.m., one minute into the turning, a distress signal went out from the EPIRB — the emergency position-indicating radio beacon. At 6:14, the transponder quit transmitting. The boat sank to the bottom of the sea. As the Silver Spray headed toward the Destination’s last known position, Prout turned on the big, bright sodium lights he uses for nighttime crabbing. He kept calling the Destination’s radio. At around 9:30 a.m., the Silver Spray arrived in the area where the EPIRB had gone off. The sun — now filtering through low clouds — illuminated the rugged, snow-streaked shoreline of St. George several miles away. Prout’s crew, directed by a Coast Guard aircraft flying overhead, found the EPIRB. When a boat goes down, the beacon is supposed to float free. But this EPIRB’s line had been curiously tucked through the black tape that secured a thick yellow coil of rope. When disaster struck, perhaps someone rigged this up before going into the water, along with a buoy that also was recovered. In hours of searching, the Silver Spray did not find any of signs of the crew or a life raft. How much is the life of a Bering Sea crabber worth? The question confronted Dylan Hatfield on April 20, 2017, as he and other relatives of the Destination crew rode an elevator to the 42nd floor of Seattle’s Union Square. The steel-hulled boat had gone down Feb. 11 — a little more than two months before — near the Pribilof Island of St. George. Dylan’s brother, Darrik Seibold, and the five other crew were killed. Dylan had worked on the Destination for six years, and considered himself part of a fraternity that had shared in the hardships and rewards of the boat’s fall and winter harvests. In death, under maritime law, the value of their lives was far from equal. 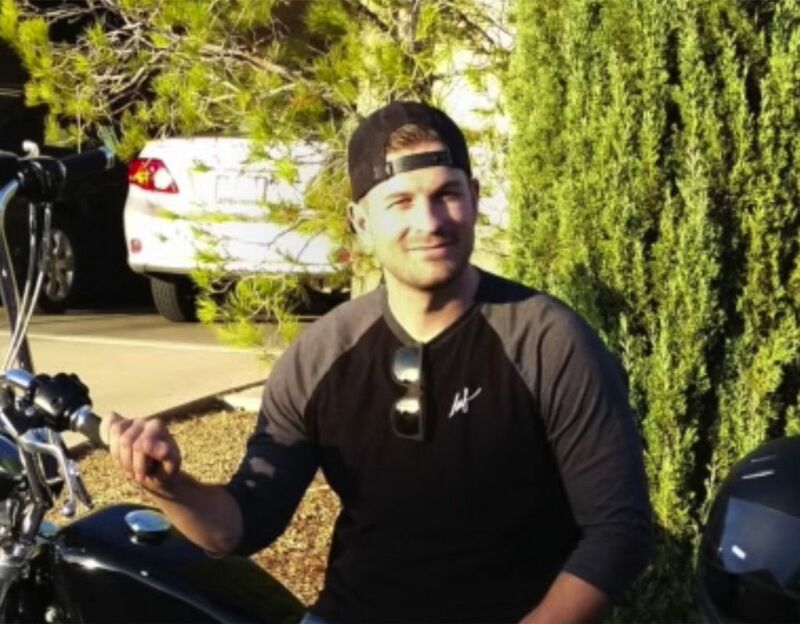 Wives and young children left behind were entitled to much more than was the family of Dylan’s close friend, Kai Hamik, a bachelor with a longtime girlfriend. On this day, guided by this law, the six families would try to agree on how to divide $5 million in liability insurance that Destination Inc. — owned by David Wilson and his brother, Louis Berntsen — had taken out on the boat. There was good reason to try to reach an accord. Failure risked a court battle with Wilson, the hands-on owner, that could leave them with nothing. Each family brought a lawyer. 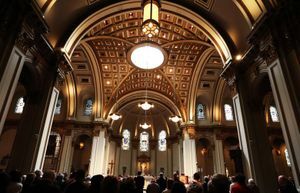 They all met together briefly, then went to separate rooms for a mediation organized by Edward “Mac” Archibald, a Seattle attorney who shuttled through the office to try to strike a deal. The losses were fresh. The next day, they would mourn anew at a memorial service for Larry O’Grady, a 55-year-old crewman from Poulsbo. A month later, Wilson’s attorney maintained that, whatever had happened, the boat owner bore no fault. So the legal liability was limited to the value of the vessel. Since the Destination was now a sunken wreck, that would add up to the value of a buoy, shot line and emergency beacon recovered by another fishing boat — less than $500, according to a federal court document Wilson’s lawyers would later file. Wilson’s insurance company, however, would pay the families the full $5 million of the liability policy. For that to happen, the families would have to agree not to go to court, where the value of their claims — if they proved Wilson did bear blame — could run more than $10 million, according to attorneys involved in the settlement talks. Darrik Seibold had left behind a son, Eli, then 3. Dylan was there with his and Darrik’s mother, Gayle Andrew, to negotiate for the boy. Through the course of a long day, they watched the mediator come in and out of their suite with a spreadsheet that outlined a tentative settlement. The biggest payment, $1.8 million, would go to the widow of a crewman with three children, the lowest sum, $160,000, to the parents of Kai Hamik, according to a court filing. Dylan and his mother found the whole process disturbing. They felt isolated from the others, pushed too fast and too hard to settle. Through the walls, they heard piercing cries. It was Kai’s mother, Judy Hamik, who later said the proposal reflected a stinging lack of respect for her son. At the end of that Thursday, the families could not agree on what was fair, and reunited to discuss their next move. They talked about asking Wilson to up the total by including a $2.5 million insurance payout the company had received to compensate for the loss of the boat. Wilson said no. And Friday morning, with no agreement among the families, his lawyer announced the out-of-court settlement offer would be withdrawn. Wilson threatened to file a federal action asserting that no money was due the families, according to a court document filed on behalf of one of the crew’s estates. That prompted a flurry of phone calls and emails between families and their attorneys to try to come to terms. Judy and her husband, Tom Hamik, still wanted to hold out. They were warned this could mess up the deal for other families. Reluctantly, they said yes. By the time they signed the final settlement, they got $200,000 for the loss of their son. 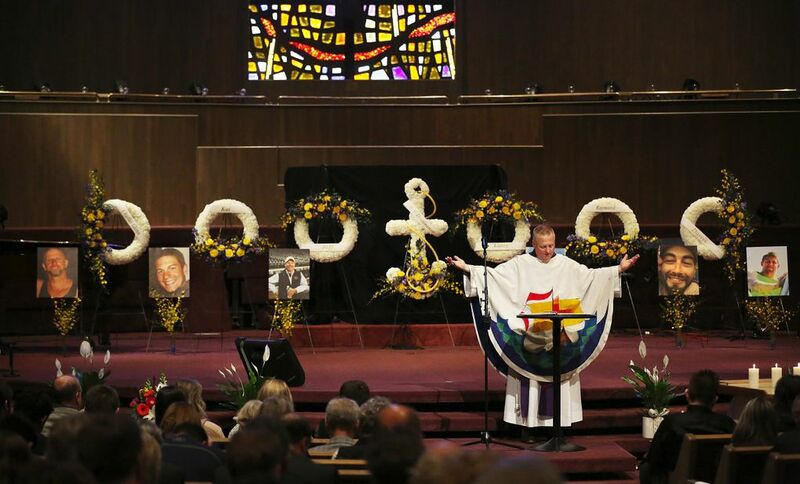 O’Grady’s service was held late that afternoon in Bremerton at the Kitsap Golf & Country Club. There were songs, remembrances and a slideshow on a gentle warm day for this man who had worked aboard the Destination for more than 20 years. O’Grady was a longtime friend of Wilson’s. The two had December birthdays and made a tradition of going out to lunch each year to celebrate. Wilson’s wife attended the service. The boat owner did not. 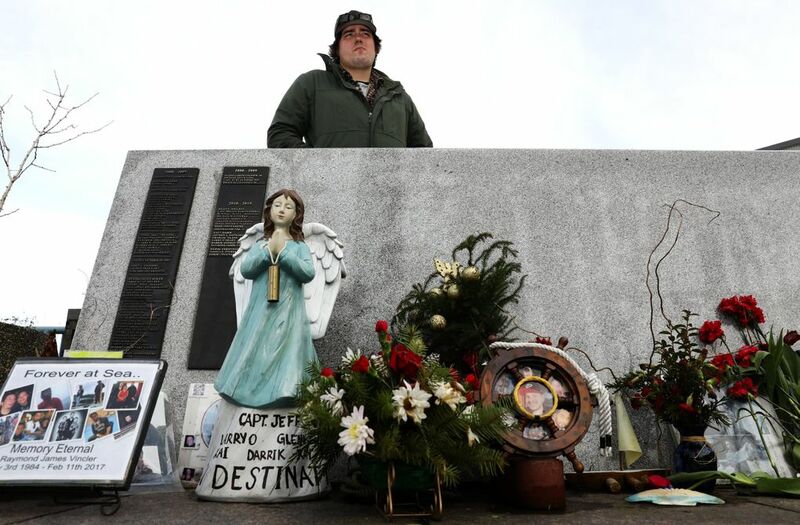 For Dylan Hatfield, the first year after the Destination sinking was a marathon of grieving, flying back and forth from his home in the fishing community of Petersburg, Alaska, to the Lower 48 for a group memorial and individual services. 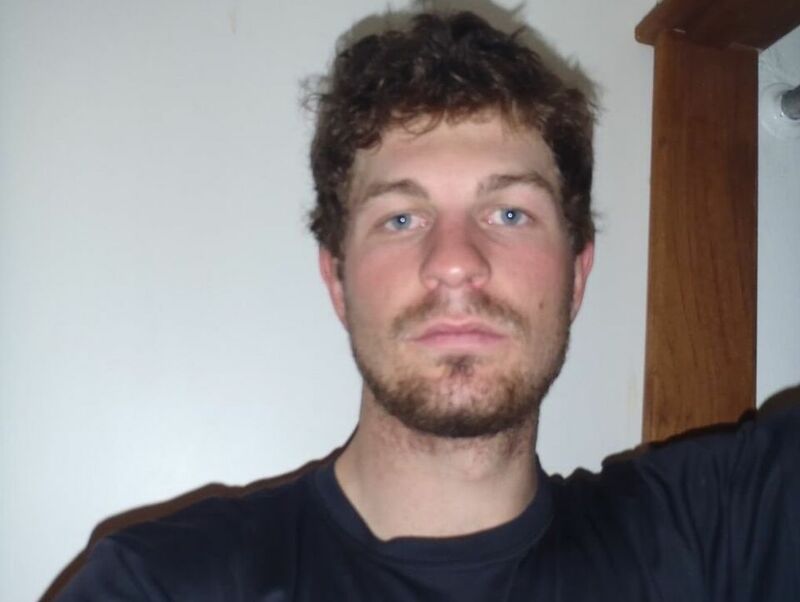 In Petersburg, he tried to console his mother over the death of his brother, Darrik Seibold. But he could not let go of the vessel and its crew. He watched videos that his friend Kai took of seasons on the boat, and scanned hundreds of pictures filed away in his computer. 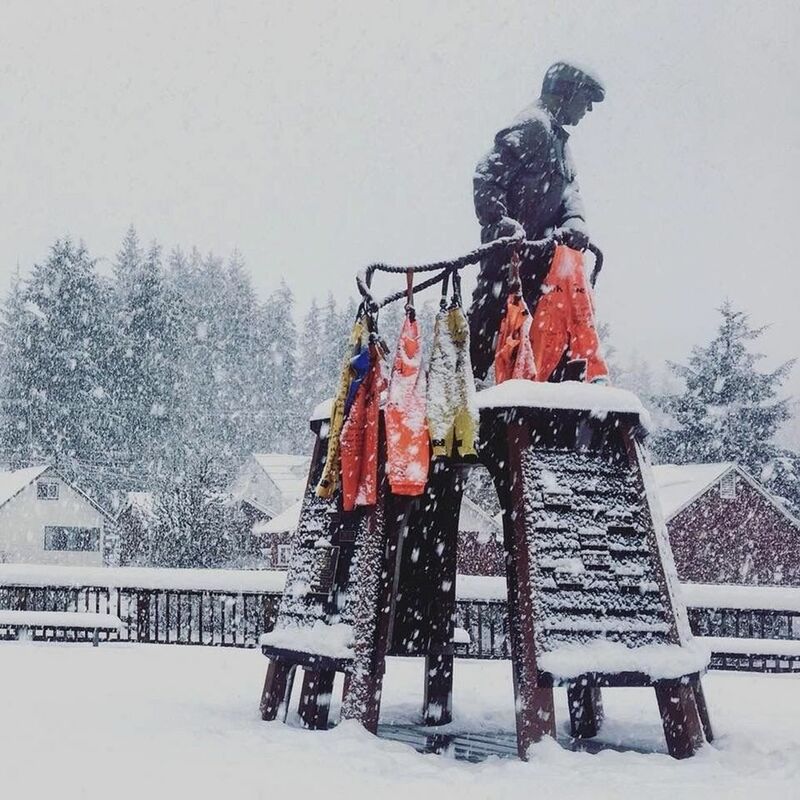 In an eerie display of remembrance, he hung six pairs of bib rain pants, each marked with the name of a lost crewman, on the bronze fisherman’s memorial statue at the Petersburg dock. Why was he alive, and not his brother? Dylan had left the Destination for another vessel that offered more money and then helped his brother, Darrik, to fill his slot. As Dylan drifted off to sleep — his body clenched. Again and again, he found himself back on the boat as water poured in, and the crew fought for their lives. In the mornings, Dylan was exhausted. Like he just climbed a mountain. Always, the question returned. What went wrong? The Bering Sea grave of the Destination lies more than 250 feet down on the ocean floor. The Seattle-based crab boat lies on its side, many of its pots apparently still on deck. The vessel went down quickly on Feb. 11, 2017, with no mayday call. 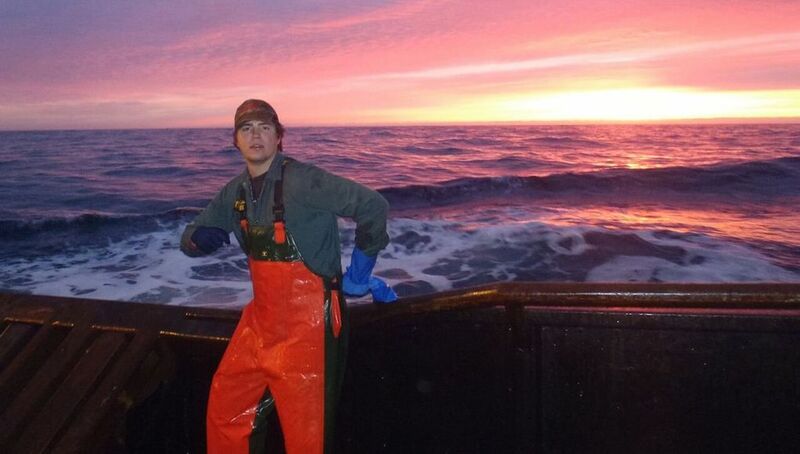 Six men died in the worst Alaska crabbing accident in more than a decade. The Coast Guard launched a Marine Board of Investigation to determine, as much as possible, what happened and to look for evidence of misconduct, negligence or willful violations of the law. 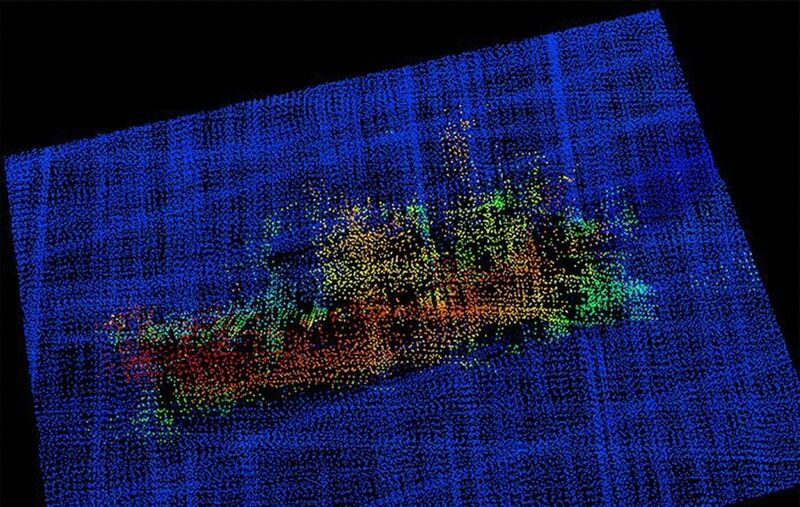 The site of the wreck — seven miles from the Pribilof Island of St. George — was confirmed by sonar imagery taken on July 8, 2017, by the crew of a federal research vessel. The Destination faced southwest, and there was a scour line more than 300 feet long where the boat appeared to have dragged along the sea bottom riven by strong currents. The crew was never found. A month later, the Coast Guard, along with the National Transportation Safety Board, convened two weeks of hearings in Seattle. Investigators lined up on a dais to question witnesses under oath. The lead witness was Destination owner David Wilson, then 68. He spoke softly, a silver-haired man in a blue blazer and collared shirt who didn’t quite look the part of a trailblazing Northwest fisherman. Wilson had dropped out of school in Sand Point, Alaska, after eighth grade, then went to sea. A skipper by his early 20s, he owned and operated boats in the intensely competitive Bering Sea crab harvests of the 1970s and ’80s. When federal fishery rules changed in 2005, the catch history of Wilson’s boats gained valuable rights — year after year — to a percentage of the overall harvests. His share could be caught by crews he hired on his boats. Or, he could sell or lease his crab-harvest rights to other operators. By the time the Destination went down, Wilson’s seagoing days were over. Former crewmen described him as a very involved owner — nicknamed “the landlord” by Jeff Hathaway, the Destination’s captain. Wilson frequently checked on the progress of the harvest from his Edmonds home, helped with supplies and other shoreside support, and knew what it took to keep the boat stable and safe. But in his testimony, Wilson often seemed unfamiliar with the details of the boat’s operations. Wilson said he was unsure how Hathaway set up shipboard wheelhouse watches. He didn’t know the weight of the pots used to catch the crabs. He was not familiar with Hathaway’s loading routines before the start of the season or the details of the Destination’s stability booklet that set the maximum number of shipboard pots in winter. “We may have spoke about stability, and many things about fishing, but I don’t remember what they are,” Wilson testified about conversations with the Destination’s captain. The next day, former crewman Dylan Hatfield was called to testify. 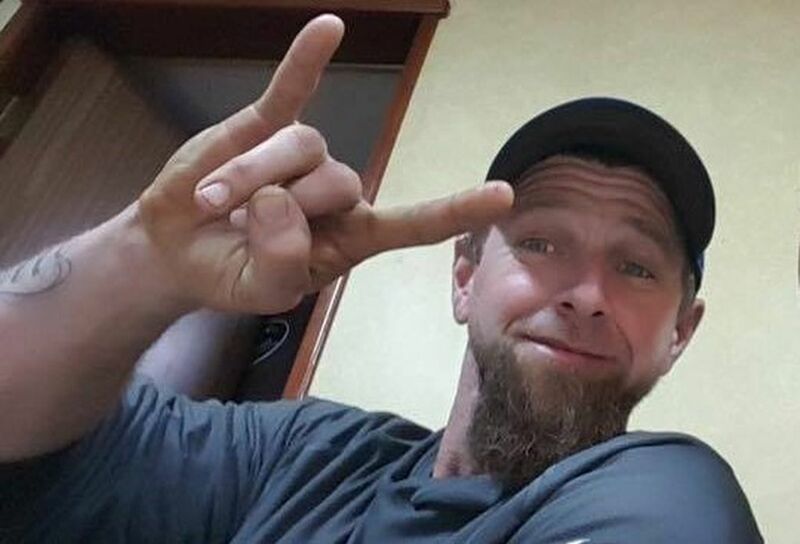 He had spent six years on the vessel and helped his brother, Darrik Seibold, and close friend, Kai Hamik, get jobs on the Destination. After the boat went down, Dylan joined in contentious settlement talks among families to determine how to divide a $5 million insurance liability policy. The investigators questioned Dylan for hours. Finally, they asked if he wanted to make any last remarks. Dylan gathered his thoughts amid a long silence. Then, he cut loose. During the hearings, Dylan spent some of his nights at a ranch near Port Orchard. Though it was his first time there, the corrals, riding stable and pond were familiar. On the Destination, skipper Jeff Hathaway had described all of it and more as he talked about the place where he and his wife raised their daughter, Hannah. Now his widow, Sue Hathaway, was enduring her first summer in decades without her man, tending to the horses and, like Dylan, struggling to understand what happened to sink the Destination. She knew firsthand the risks of Bering Sea crabbing. As a young woman, she worked as a cook on a crab boat, and told Dylan about her own maritime disaster when she caught a ride on a vessel that rolled over. She spent hours in the water in an insulated survival suit until she made it to a life raft. Her husband likely had no time to put on a survival suit. Even if Hathaway and the five other crewmen had managed to escape, they might not have been able to reach the life raft. As a boat goes down, the life raft is supposed to break free. The Destination’s was never found, so it may have stayed secured on the vessel. “If the life raft didn’t disengage, somebody has to answer for that. That is huge,” Sue Hathaway said. After the hearings, Dylan returned to Petersburg. He drank too much. He gained weight. His hair grew long and stringy. Still, in October 2017, he had every intention of working the Bering Sea king crab harvest. For the past three seasons, he had crewed aboard the Seattle-based Kari Marie for the skipper Jon Forsythe. As the date approached, Dylan was wracked by indecision. He had prided himself on being a reliable crewman. A guy who always showed up, did the job. But he thought his return to crabbing would be selfish, further stressing his mother, Gayle Andrew. Her son Darrik’s death was a second shattering loss to the sea. In 2008, the same year Dylan began his crabbing career, her longtime boyfriend, Tom Lewis, a halibut fisherman, went missing. When the day came to fly out to Dutch Harbor for the start of the season, Dylan’s bags were packed. But he felt paralyzed. He couldn’t go to the airport. He stayed in his room in Petersburg, and broke down in tears that flowed for days for the Destination dead and his own inability to return. “I didn’t want to bring any more pain,” Dylan said. 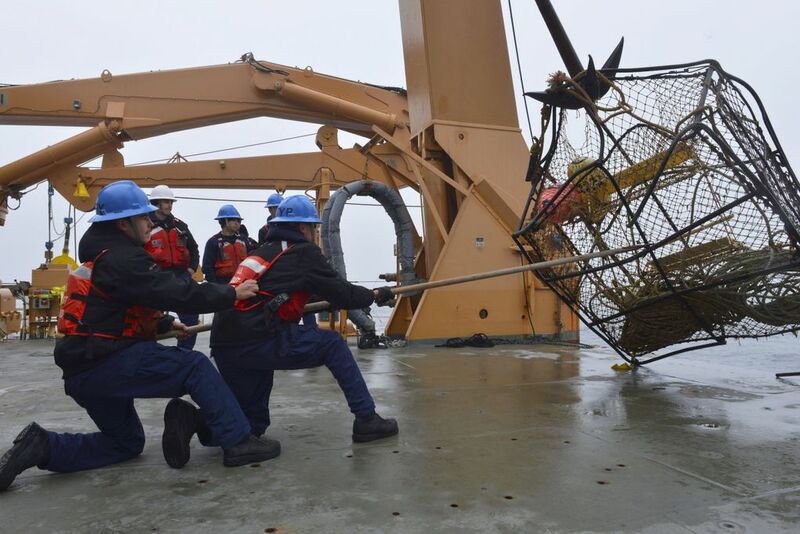 The Coast Guard retrieved a single crab pot — battered and rusted — from the ocean floor near the sunken Destination. Investigators weighed, measured and photographed the pot, then turned it over to captain Jeff Hathaway’s widow, Sue, on Dec. 11, 2017. As she loaded it on to a truck for the trip back home to her ranch near Port Orchard, two scallop shells fell out of the pot, along with a sea-bottom stone. The scallop shells fit together with a tear-shaped hole in the middle of one. The stone bore a remarkable resemblance to Priest Rock, a towering crag near Dutch Harbor burned into Sue’s memory more than 35 years earlier when the boat she was riding on went down. After she was rescued, this was the welcoming landmark she saw on her way back to port. And in the many years that followed, Jeff would be sure to give a call home as the Destination passed by it. For Sue, the pot had delivered precious gifts, sent from the deep by her husband. The 7-foot-long pot now sits on a platform outside Sue’s front door, a statue of a guardian angel by its side. After the Destination went down, David Wilson transferred the crab shares held by his company — Destination Inc. — to other boats. So the company keeps earning profits from the Bering Sea king and snow-crab harvests. On shore, Wilson has added to his real-estate holdings. In September 2017 — nine months after the Destination went down — he bought a $1.67 million, three-bedroom home in Kailua-Kona, Hawaii. The purchase galled some family members of the Destination crew. Wilson, who declined repeated requests for interviews, continues to grieve. He is a “broken man” said Gail Plummer, the widow of crewman Larry O’Grady, who was a longtime friend of Wilson’s. The first report on the sinking of the Destination became public in July 2018. A National Transportation Safety Board review put much of the blame on Jeff Hathaway. The report concluded the captain, facing a forecast of freezing spray, didn’t do enough to ensure the boat’s stability. 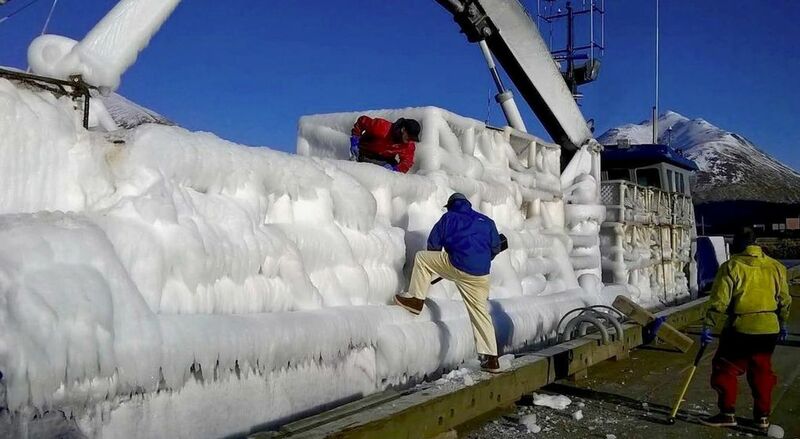 Then he failed to remove ice that was assumed to have built up on the boat. The Coast Guard has not released its full investigative report. But a key document — a stability analysis also made public in July 2018 — raised questions about the oversight by Wilson and those he paid to watch over the Destination’s safety. Hathaway’s loading of the boat was guided by a stability booklet developed nearly a quarter-century earlier by naval architects, maritime experts who conducted tests to develop the maximum loads allowed on deck. The Coast Guard analysis indicated the booklet was flawed or badly out of date. The Destination, as loaded for the final voyage, failed to meet federal stability standards. 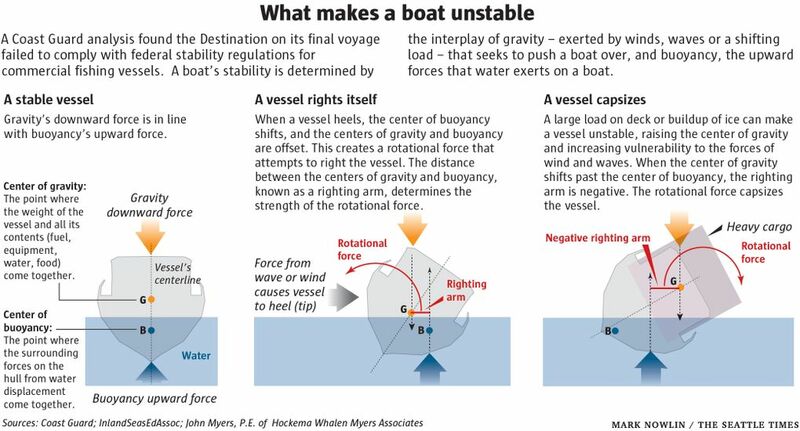 Specifically, the vessel’s righting energy, the ability to stay upright as waves rock it from side to side, fell “far below” the required minimum levels, and had been further impaired by a 2013 modification — called a bulbous bow — intended to improve fuel efficiency, according to the analysis. The bulbous bow was designed by Kraftmar Design Services. In a January 2013 letter to Wilson, Kraftmar’s Gisli Olafsson said the boat was safe to operate. But he noted “our understanding” that a new stability test would be done by the end of that year. The test would have enabled the shipboard booklet to be updated. There is no record that Wilson followed through with the test, according to Coast Guard investigators. “We told them what to do and they didn’t do it,” Olafsson said. Dylan was sickened by the Coast Guard findings. 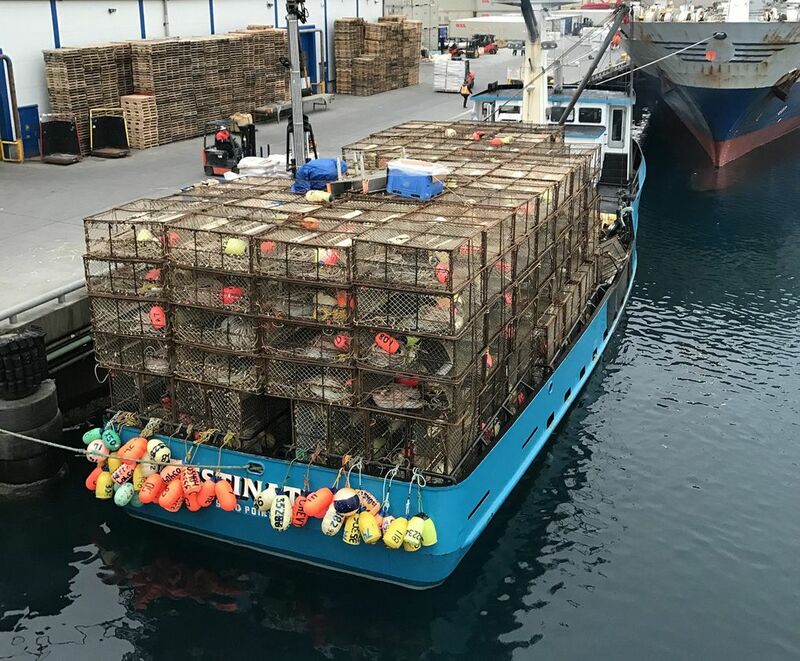 Reporting for this story included interviews with former Destination crew, family members, Bering Sea crab captains, fishing-industry safety experts and maritime attorneys. Documents reviewed included transcripts of Coast Guard hearings, dozens of exhibits made public through that investigation, National Transportation Safety Board and court records, commercial-fishing fatality statistics and federal fishery studies detailing the economic history of the Bering Sea crab industry. Seattle Times news researcher Miyoko Wolf contributed to the reporting. “I always thought our boat was safe, and that the people David Wilson hired to oversee the shipyard work would make sure of that,” he said. If the Coast Guard analysis had been available during the negotiations over the insurance, Dylan says, he would have pushed for the families to go to court. Not strike a deal. Dylan wonders how many other stability booklets have not been updated. The Coast Guard in the fall 2017 checked the weights of pots on more than 40 other boats, and found many were significantly heavier than assumed in the booklets. Dylan hopes the Coast Guard will step up oversight. But he is ready to move on. He has resumed his fishing career, joining a Petersburg-based crew to catch halibut, black cod and salmon. Last summer a fierce wind storm kicked up, and so did Dylan’s emotions. He worked through his fears and completed the season. In November he came to Seattle for the Pacific Marine Expo, a major draw for fishermen, where he ran into Forysthe, captain of the Kari Marie. They hadn’t talked since Dylan failed to show up for the 2017 king-crab harvest. Dylan was still embarrassed. Forsythe gave him a hug, and said there was no need for apologies. The crew missed him and wished him the best. Dylan was thrilled to reconnect. In the fall, Dylan also helped bring the Petersburg boat — the Odin — down to Washington to prepare for the Dungeness crab harvest. In January, the ocean Dungeness crab season, after a series of delays, finally opened. Just before the Odin left Westport, Dylan got another reminder of the perils of the work: A crab boat capsized off Newport, Oregon, killing all three aboard as they tried to cross a bar on their way into port. Dylan fielded calls from friends and family. He told them he was OK, and headed to the Pacific to catch crab.